Daisy Makeig Jones, born in 1881, was from a small mining village near Rotherham. She was the oldest of a family of seven children and her father was a doctor. She showed exceptional artistic talent from a young age. When the family made the move south to Torquay, she quickly enrolled in the School of Art. Through a relative she was able to obtain a meeting with Cecil Wedgwood, the director of Wedgwood China at the time. In 1909, Daisy Makeig Jones joined the pottery as a designer in training. By 1914 she was considered accomplished enough to have her own studio. She began making Wedgwood Fairyland Lustre in 1915, and continued on as head of the department through 1941. Production nearly stopped in 1931 because of the global recession, and the main showpieces from the collection were crafted in the 1920s. Wedgwood Fairyland Lustre is in fashion with collectors today because it looks totally unique from the rest of Wedgwood china production. Daisy’s designs mostly used black or orange for the background, and then were decorated with ghosts, goblins, elves, and fairies of all different designs, shapes, sizes, and colours. Her magical pieces show her vivid imagination. 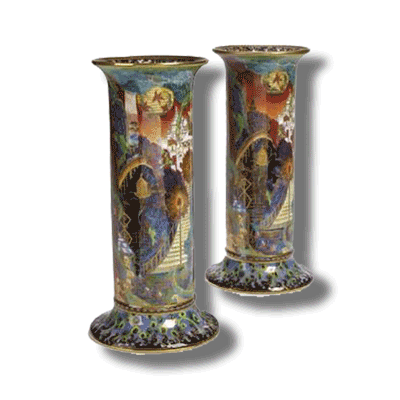 This unique pottery style breathed life into what had become a dying company. Wedgwood was highly prominent in the 18th century. But in the 19th century the wares lacked innovation, and the company was nearly bankrupt at the beginning of the 20th century. 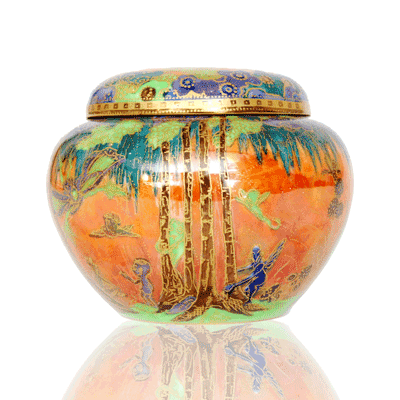 The new glazing techniques and dazzling colours with iridescent finishes in Wedgwood Fairyland Lustre helped the company become profitable once more after World War I. The first Wedgwood Fairlyland Lustre designs featured natural depictions of butterflies, fish, birds, and dragons in bright colours. Pixies, sprites, elves, and fairies followed, inspired by contemporary illustrations. Not everyone appreciated the innovative designs, but those who did were passionate collectors. Daisy Makeig Jones retired in 1931 and died in 1945, but her Wedgwood Fairyland Lustre productions are growing in popularity among today’s collectors. If you would like a free, no obligation valuation of your Fairyland Lustre please use the form below. You can also email details about your Fairyland Lustre to [email protected] or call us on 01270 440357. Thank you for your message. We will be back in touch as soon as we can. We have helped sell hundreds of items for our clients. You can read their reviews by searching Google, Yell or Facebook for Mark Littler. Here is just a selection.